Referred to as Hot-lanta for the region's intense summer heat, NASCAR has always scheduled a race before spring on the 1.54 mile speedway has classically allowed Atlanta Motor Speedway to host an early race to the NASCAR Sprint Cup Series tour. On the first week of March, some past events would see the grounds of Atlanta Motor Speedway blanketed with snow. However, for the running of the 2010 Kobalt Tools 500, a 60 degree Fahrenheit day brightened the NASCAR Sprint Cup cars paint schemes with constant late winter sunlight. Taking a popular pole position after a Friday night qualifying session, Dale Earnhardt Jr led the 43-car NASCAR Sprint Cup series field to the green flag with the Amp Energy #88 Chevrolet. Earnhardt's prime starting position would not even net the Hendrick-owned Sprint Cup car a single recorded lap in the lead. Asserting some muscle on the outside front row, the #18 M&M Toyota piloted by Kyle Busch flew around Earnhardt for the race lead on lap 1 holding the top spot for 13 circuit. Kyle Busch's stint in the Atlanta lead would be broken by the fast #9 Ford of Kasey Kahne. Coming off a 9th place finish in Las Vegas after starting the 2010 year with two disastrous start, Kahne and the Richard Petty Motorsports team is eager to reverse their racing fortunes. Atlanta Motor Speedway would in fact result a memorable turning point for the 4-car Ford effort. Busch recaptured the lead of the Kobalt Tools 500 just before a caution for debris forced the field to slow. With the field bunched on the restart, the jockeying for position figured heavily on the very brief green flag period which ended 2 laps later. Out of turn 1 of lap 43, an aggressive #12 Dodge driven by Brad Keselowski nosed into the rear of Carl Edwards driving a "retro-themed" #99 Ford (Edward's paint scheme and Scotts Lawn Care sponsor was a throwback to his maiden 2005 Cup victory. Five years being classified as retro is quite a stretch). As Edward's Ford swung up the track, he collide with the Toyota of Joey Logano damaging both machines as they grind the outer wall. While Logano and Edwards would require time-consuming repairs, Keselowski faired better even being a firm front-runner as the race endured. After the lap 43 restart, a new contender for the day emerged in Atlanta as Penske Racing's lead driver Kurt Busch added some intensity to the Kobalt Tools 500. Starting 11th, Busch advanced his #2 Miller Lite Dodge skillfully, taking the race lead for the first time on lap 82 thanks to a well-executed pit stop as the majority of lead lap cars rushed for crew service. Between Kurt Busch and Kasey Kahne, the two drivers dominance kept the front of the race familiar leading 273 laps on the day. Coupled with the #17 Ford of Matt Kenseth, Denny Hamlin's #11 Toyota and Juan Pablo Montoya driving the #42 Chevrolet, the top-5 was secured between the same five cars following the first 300 miles. Another car many hoped would be a top-5 contender through the day was, of course, the pole-sitting driver Dale Earnhardt Jr. Showing the ability to hold onto the top-10 in the Kobalt Tools 500's initial stage, the #88 fell to misfortune as Earnhardt began reporting a suspected loose rear wheel. Making it to the pits for unscheduled service, the #88 Chevrolet continued but was well down the race's running order. The problem compounded when a caution was thrown just a few laps later when Hendrick teammate Mark Martin spun when his #5 blew a tire. Interesting enough, almost every Hendrick-supported team (including the Stewart-Haas Racing cars) suffered some kind of tire problem. Mired around 31st position through the mid stages of the Atlanta race, Dale Earnhardt Jr and the #88 AMP Energy Chevrolet never returned to winning contention. However, he was able to use late race fitration to the competition as well as a wave-around opportunity to cycle back into the lead lap. As closed on its final 2 laps, the effects of an earlier race incident weighed on Carl Edwards. At lap 323, the #12 car of Keselowski came into sight of the Roush-Fenway #99 Ford walking wounded with fresh memories of the lap 43 accident. As the two cars shot out of turn 4, Edwards might have viewed this as a window of opportunity open for paying back Brad Keselowski. Heading down the Atlanta Motor Speedway frontstretch, the #99 Ford purposefully swiped the left rear corner of the #12 Dodge as speeds reached over 170 miles per hour. 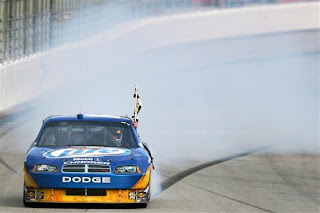 As the #12 of Brad Keselowski was sent sideways towards the infield grass, air caught the underside lifting Keselowski's Dodge precariously airborne. Off the ground, the Dodge slammed into the outer retaining wall impacting the driver's side A-pillar section of the Dodge's roof. As the car rested upright, the fate of the driver was an immediate concern. Thankfully as the window nest dropped, it came as a relief (even to Carl Edwards) that Brad Keselowski was conscious as he hopped to the ambulance. Based on the evidence the Edwards intended to turn Keselowski, NASCAR ruled to park Carl Edwards for the remaining laps. There also exists the possibility that NASCAR may penalize Edwards farther as they are continuing to review the incident. As the wreckage of the #12 Dodge had to be removed, the race was to be settled by a green-white-checker restart. With many of the leaders pitting, #33 Chevrolet of Clint Bowyer and #98 Ford of Paul Menard elected to stay out gambling on track position. Restarting the 339th lap (5 laps passed the race's scheduled distance), the Menard and Bowyer were quickly passed by Kurt Busch. As the #2 Penske Racing Dodge prepared to roll to victory, a 7-car wreck in the middle of turn 3 and 4 was sparked when Jamie McMurray's #1 Chevrolet took a low entry into the 3rd corner sliding out of control. Mark Martin, Denny Hamlin, and Martin Truex Jr were among the drivers collected in the late race crash. Because of timing of the wreck, the race was thrown under caution just before Busch took the white flag. Disappointed but determined to win the Kobalt Tools 500, Kurt Busch's Dodge launched on the second attempt of a green-white-checker restart leading the final 2 laps to win at Atlanta Motor Speedway. Peforming his celebration at driving in reverse, Busch, the #2 Penske Racing pit crew, and the car owner Roger Penske were present in victory lane shortly after Kurt Busch finished. In second place of the Kobalt Tools 500, Matt Kenseth provided Roush-Fenway Racing team with the strongest run of the 2010 NASCAR Sprint Cup season. 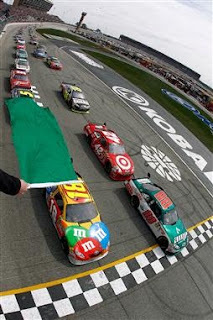 Behind Kenseth, Juan Pablo Montoya ran an outstanding Atlanta race where the Colombian driver was even eyed for victory. Kasey Kahne finished fourth while strategy helped Paul Menard claim an admirable top-5 position. Not only did Kahne and Menard register their best finishes for the new season, these cars share Richard Petty Motorsport affiliation. Just behind the pair the Richard Petty Motorsport Ford team became a trio as AJ Allmendinger brought the #43 car home in 6th place. Other cars claiming notable runs include Kevin Harvick who emerged from 35th to 9th, Scott Speed in 10th outcoming a 32rd place qualifying effort, Marcos Ambrose in 11th and Regan Smith who brought his #78 Furniture Row Chevrolet in 14th place. Also worth mentioning is the effort of Dale Earnhardt Jr and #88 Hendrick Motorsport team. Through the race's latter stage, the AMP Energy car rose to 15th place recovering from two laps down. Elevating himself up 9 spots in the 2010 NASCAR Sprint Cup points after 4 races, Kurt Busch sits 10th overall 142 points behind Kevin Harvick who continues leading the standings for the 3rd week in a row. Matt Kenseth, Greg Biffle, Jimmie Johnson and Clint Bowyer currently follows Harvick, all within 86 points. The NASCAR Sprint Cup series has an off-weekend this coming week but will return on the 21st of March to run the Food City 500 at Bristol Motor Speedway.